1.First Phase: 1786 To 1969. 2. Second Phase: 1969 To 1991. 3.Third Phase: After 1991 i.e. Reformatory Phase. The first Bank of India i.e. the General Bank of India was established in 1786 named as Bank of Hindustan and Bengal Bank. These three banks are Independent Banks and these units are called as Presidency Banks. These three Banks i.e. Bank of Bengal, Bank of Bombay, Bank of Madras were amalgamated in 1920 and the Imperial Bank of India, a bank of private shareholders, mostly Europeans were established. Allahabad Bank was setup, exclusively by Indians in 1865. Punjab National Bank i.e. PNB was established in 1894 with its Headquarters in Lahore at the time of establishment but now its headquarters at New Delhi. Between 1906 and 1913, a few banks were established during these periods i.e. Bank of India, Central Bank, Bank of Baroda, Canara Bank, Indian Bank and Bank of Mysore. The Reserve Bank of India Came into existence in 1935 under RBI Act 1934. To streamline the functioning and activities of commercial banks, the Government of India set up with the Banking Companies Act,1949 which was later changed the name to Banking Regulation Act, 1949. In 1955, Government of India nationalised the Imperial Bank of India and started offering extensive banking facilities, especially in rural and semi-urban areas. The Government of India constituted the State Bank of India to Act as the principal agent of the RBI and to handle banking transactions of the Government of India and the State Governments all over the country. Mainly 7 Banks owned by the Princely states were nationalised in 1959 and they became subsidiaries of the State Bank of India. In 1969 there are 14 Commercial Banks in the country which were nationalised. 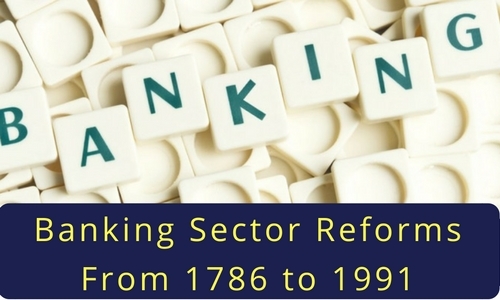 In the phase of banking sector reforms, 7 more banks were nationalised in 1980. With this, 80% of the banking sector in India came under the government ownership. In this phase, many more products and facilities in the banking sector have been introduced as part of the reforms process. In 1991, under the chairmanship of M Narasimham, a committee was incorporated, which worked for the liberalisation of banking practice due to the various problem identified in Indian Banking System. Major Problems were Identified by Narasimham Committee are Direct Investment Programme, Direct Credit Programme, Interest rate structure, Modifications of Banking Systems, Transparency problem with Indian Banks, etc. In this phase, the country is flooded with foreign banks and their ATM stations. Efforts are being put to give a satisfactory service to customers of Banks. In this phase, CORE banking, Phone Banking, Internet banking & Electronic transactions are introduced. The entire system became more convenient and swift. The Narasimham Committee I (1991) was set up to rejuvenate the Indian financial health of commercial banks and to make functioning the banking sectors in an efficient and profitable way. This committee was set up to study the problems with Indian Banks & to suggest some recommendations for improvement in the efficiency and productivity of the financial institutions. In 1998 the Government of India appointed one more committee under the chairmanship of M. Narasimham to review the progress and design a programme for further strengthening the financial system of India if needed. The Narasimham Committee II (1998) placed greater importance on structural measures and improvement in standards of disclosure and leaves of transparency. This committee basically appointed by Government to focus on various areas such as Capital Adequacy, Merger & Amalgamation of Banks, Bank legislation, Review of Banking Laws etc.